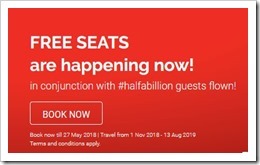 AirAsia Free Seats promotion is back today! This is a quarterly sales event and offer up to 5 million promotional seats to be grab. For all in as low as RM15(including taxes and fees), you can fly locally to places like Alor Setar, Johor Bahru, Kota Bharu, Kuantan, Langkawi, Penang, Kuala Terengganu and Miri. AirAsia Group Bhd is running a Free Seats promo and up to 5 million promotional seats to be grabbed! This promo start from 2 September 2018 to 9 September 2018 and for travel between 18 February 2019 and 26 November 2019. AirAsia is running Free Seats promotion at this moment. There are up to 5 Millions promotional seats to be grab. The FREE SEATS booking period is from 21 May 2018 until 27 May 2018 for traveling between 1 November 2018 until 13 August 2019.